AHEAD of the presidential run-off in 2008, she surprised a rather powerful meeting by asking why ZANU-PF was beating up people in rural areas. The subsequent frosty moments were only broken by former police chief, Augustine Chihuri, who casually remarked, "if the Honourable Vice President gives us exact locations, we will investigate." However, Mujuru's letter took the back seat after I saw Baffour Ankomah's piece entitled "How not to run an economy." It read like a critique of Zimbabwe Finance Minister Mthuli Ncube's performance. My attention was also drawn to Hopewell Chin'ono's article, "Imagining a better 2019 and reforming our media landscape into the 21st Century." I hold both writers in high regard. During my time as President Mugabe's principal private secretary, the highlight of Baffour's sorties into Harare was an interview with Mugabe. This was always with the support of George Charamba. I am still trying to restrain my mind from overthinking as I reflect on Baffour's story about Ncube. I first connected with Hopewell via LinkedIn. I had already seen the brilliance of his work. I follow him on Twitter to this day. Nevertheless, I think his story on reforming the media landscape read like a travel magazine. Calling all viewers, advertisers and investors; ZBC is open for business! In this regard, I believe the story skipped a few key points. Long before the November 2017 coup, Charamba said to me, "Kamwi, it doesn't matter how healthily you eat, how well you look after yourself; there is one enemy you can't defeat. And that is b-i-o-l-o-g-y!" As if reacting to cues, he added: "ED does not play with small money; forget Mai Mujuru's poultry projects. Look at the National Defence Forces College, $98 million; the LongCheng Plaza. We invited the President to officially open the NDF out of respect. Right now, we are working on the media, so that when ED takes over, our rollout plan will be complete." I did not have answers to his remarks. I tried to engage him in conversation when it came to the Mazowe Children's Home. His claim was that it does not belong to Mrs Mugabe. I first worked with Mrs Mugabe on the Zimbabwe Children's Rehabilitation Trust (ZCRT) in early 1997. In September 1997, assisted by two businessmen, I led the ZCRT's first major fundraising drive in Florida. So positive was the atmosphere that it was agreed to have the dinner speech delivered by President Mugabe on behalf of the ZCRT while simultaneously calling for investment into Zimbabwe. I also know every attempt that was made to launch the Trust in Zimbabwe, the faltering starts, and the huge commitments by the councils of Harare and Bulawayo to donate land for the ZCRT children's homes. But, they were many competing interests. I was personally disappointed to see some of the most capable people on the initial ZCRT board mysteriously discarded. Factionalism was sprouting. The Mazowe Children's Home was eventually inaugurated on 23 July 2006. The ZCRT would morph into the Grace Mugabe Foundation. However, a bigger complication was the presence of a Taiwanese group called Amitofo at the ground-breaking ceremony. The ministry of foreign affairs alerted me to the problems this would raise with mainland China. When I told President Mugabe about it, he directed that his wife's speech would only focus on the project. I was to draft another speech for him that would explain the tenuous relations with Amitofo. Notwithstanding this history, Charamba insisted that the children's home is a (Chinese) government-to-(Zimbabwe) government project, which will fall under the ambit of the government of the day. I have provided this background to illustrate the difficulty of Zimbabwe's governmental system. While I admire the lengths to which Hopewell has gone in mobilizing support for the ZBC, I remain concerned at how much of his work will see the light of day. In the late 80s and early 90s, ZBC reporters attended refresher courses at CNN. This is how Norman Tirivavi came back with the nickname, "the biggest!" Other reporters went to the less prestigious former East Berlin Institute of Journalism. Besides training and refresher courses, journalists were exposed to various short-term workshops covering different areas of specialization. Our training was done by such veterans as Shingirayi Tungwarara, Anani Maruta, Joseph Madhimba, Chris Somo, David Mwenga, Ben Mugabe and the BBC's Anne Catchpole. Sadly, most of these shining beacons have passed on. Even if – I repeat – even if, the ZBC was not at par with other broadcasters, it was not the pathetic station presented by Hopewell. And this begs the question, why? It has had a parent ministry all along. I like Hopewell's choice of words. 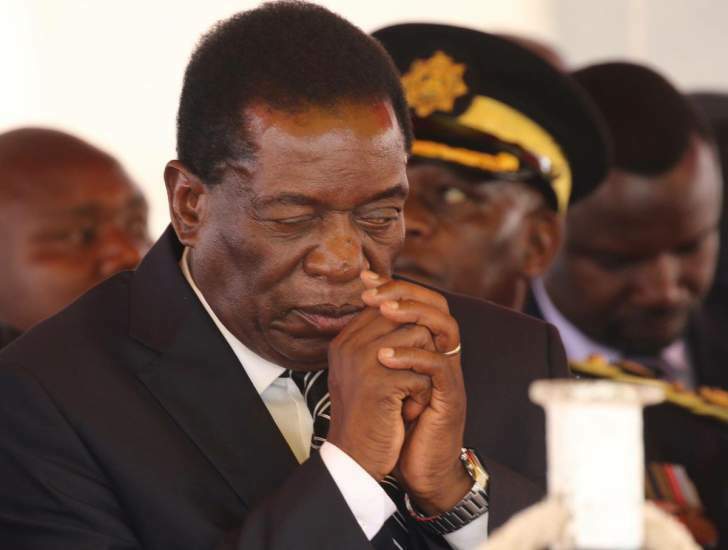 He writes: "men are blessed with the gift of the gab and many of us deploy it with terrible consequences…That is where President Emmerson Mnangagwa and his team are today, on this very first day of the year; they spoke a good game, they now need to deliver." I am also glad that he describes his welcome of the new dispensation in sober terms: "when Robert Mugabe was removed from power in November 2017, I made a conscious decision to support the transition because I realized that there was no other alternative to the new outcome, it was an inescapable reality." It is easy to speak about "Mugabe's days of terror, repression, economic meltdown, selfish inward looking, international isolation, unprecedented corruption and gross incompetence." But he did not operate on his own. Further, people have overestimated his power. I worked with the man. No, he was not a saint. However, in similar fashion, I do not accept the exaggeration of his sins. One of Mugabe's uneasy moments was seeing Mnangagwa arriving for a meeting with the former commander of the defence forces (now, one of the vice presidents). He would ask: "but I thought you said Mnangagwa asked for a meeting? Then why did he bring the CDF?" I could not answer that question. Things came to a head when Mnangagwa asked for a meeting to discuss the elections of the parliamentary speaker. The MDC-T had put forward the same candidate, Lovemore Moyo, while ZANU-PF had Simon Khaya Moyo. Undercurrents suggested another segment of ZANU-PF wanted a different candidate. And this is how President Mugabe accepted Mnangagwa's request for a meeting. The President had a 3:00 pm meeting with Prime Minister Morgan Tsvangirai and so he scheduled the Mnangagwa meeting for 2:45 pm. Close to the time, ministerial cars arrived. It was Mnangagwa, two other ministers and the CDF. Immediately following were mini-buses which disgorged 32 Chinese nationals from the ANJIN company. The President was livid when I told him about this. He asked to see Mnangagwa privately. A few minutes later, Mnangagwa came out smiling and said "the President says get the boardroom ready." The Prime Minister's meeting was pushed back to 3:30 pm. On another day, Mnangagwa and the CDF held an extraordinarily long meeting with the President. I only got to know how acrimonious the meeting was when Mrs Mugabe called. The two had allegedly held the President hostage in his office for four hours. At issue was the subject of diamond mining, where the defence forces were unilaterally expanding the size of their concession. In this expansion, they had also taken over a "protected" concession. The former first lady claimed they refused to listen to the President's reasons for the existence of the disputed mining claim. I wish the work to rebuild and modernize ZBC all the best; we long for better news bulletins and all-round quality programming. Yet something seems to say, it will not be a walk in the park. My simpler wish is for an improvement in people's lives in 2019. It has been long in coming. Lawrence Kamwi is a former broadcaster and former Principal Private Secretary to Mugabe.